Three police officers, injured when a high speed police chase from one end of Cambridgeshire to the other resulted in a five car crash which shut the A1M at Peterborough for eight hours, have been discharged from hospital. A female police officer suffered serious injuries while a second female police officer and a male police officer were also injured in the incident. All three officers have now been released from Peterborough City Hospital and are recovering a spokesman said today, Friday July 22. Police attempted to stop what is suspected of being a stolen car in Eaton Socon, St Neots, at 4.10pm on Wednesday July 20. The vehicle made off at high speed and was chased along the A1. The chase ended when the vehicle crashed into the central reservation at the Haddon services junction for Peterborough, becoming wedged under the crash barrier. The crash also involved two police cars and two further cars driven by members of the public. All eight lanes of the A1M were closed. A 22-year-old man driving the car was arrested at the scene and was taken to Peterborough City Hospital, where he remains in a serious, but not life threatening, condition. The Independent Police Complaints Commission and The Police Standards Department were contacted by Cambridgeshire Constabulary but the investigation remains with the roads policing unit at this time. A police spokesman said: “Police can confirm a collision involving multiple vehicles has occurred on the northbound carriageway on the A1M. “Two police cars were pursuing a vehicle which was suspected of being stolen and had failed to stop. “The collision happened near the Norman Cross junction at 4.30pm and involved five vehicles. “The vehicles were two police cars, the alleged stolen vehicle and two members of the public. “The injuries are not thought to be serious or life changing. Delays built up on the A15 and were made worse by a crash on Fletton Parkway at around 7pm which shut two lanes of the westbound carriageway but has now been cleared. The southbound A1M was reopened at 8.26pm but the northbound carriageway was not fully opened until 12.20am after Highways England has replaced the damaged crash barrier. 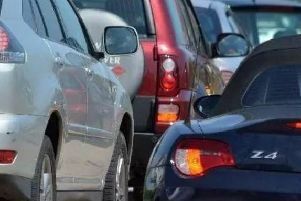 Motorists reported delays of five hours on the northbound carriageway.